Good Living 123 | Articles in this blog focus on good living, from pets and travel, to family and perception, with lots of free recipes and helpful ideas and tips. Check it out! The 90-second trailer for the book “Encouragement: How to Be and Find the Best” is on YouTube now! You’ll find the paperback and digital format editions everywhere quality books are sold… from Amazon to Barnes & Noble and beyond. 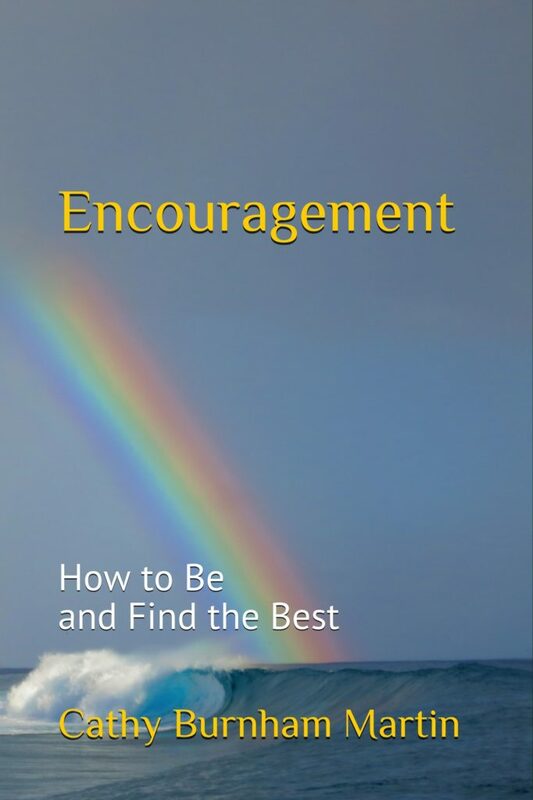 In her extraordinary book, Encouragement: How to Be and Find the Best, author Cathy Burnham Martin exudes an enthusiasm for life unmatched in other self-help books that claim to boost your spirit and world view. Burnham goes on to provide a wealth of lists, tips and inspirational quotes to bolster her assertions that anyone can attain — and keep — a winning attitude. On the flip side, she also warns against extensive association with negative individuals whom she calls “Discouragers,” who carry with them each day an abundance of negativity which they bestow freely upon anyone who is finally getting the upper hand on things. “Discouragers see the gloom in every room, the cloud on every silver lining, and the problem in front of every solution,” Burnham reports. “Sometimes the brightest lights come out of the darkest corners,” she intones during a brief discussion on the value of not giving up. Space limitations on this review require us to fall back on the timeworn saying that you’re just going to have to get this incredible new book and read it cover to cover in order to get the maximum impact from it. Five-plus stars to Encouragement: How to Be and Find the Best. Get it for yourself or as a special gift to anyone who has issues with self-esteem or is dealing with hard times. It might not cure their lifelong feelings of inadequacy, or be a cure-all for their current circumstances, but it could definitely provide lifesaving inspiration and a firm footstep toward a more meaningful tomorrow. I ask myself that question any time I catch myself wondering why some other person does not seem more supportive or positive. We all may wonder such things from time to time, particularly when the naysayer lives in our inner circle of close friends or loved ones. That’s when I try to say, “Woah!” Am I supportive of them? I truly only have control over my own thoughts, words, and actions. It sure helps me when I stop focusing on someone else’s negative. Did I listen when they spoke? Did I genuinely try to see the situation from their perspective? Did I deliver building blocks or stumbling stones? Did I speak words that revealed compassion and encouragement? Did I do anything to make them feel worthy or capable? Did I recognize their achievement, even small steps toward their goal? Did I leave them with strengthened resolve and boosted self-confidence? I try to ask myself such questions whenever I catch myself thinking or speaking or even feeling negative toward someone. I know. I know. Sometimes that someone may have been sucking the air out of the room, squelching my creativity, diminishing my dreams, directly or indirectly putting me down. They may well have been highly discouraging. Step one for me is trying to not absorb their negativity. I don’t want to accept pity party invitations. Encouragement just may be one of our most vital personal and professional Life skills. So, it thrills me to say that encouragement is the theme of my newest book. Encouragement: How to Be and Find the Best is now available in paperback and digital formats. The Audiobook is in production! Who do you know who is feeling stifled or unheard? Who may be needing a morale boost or a little light on the horizon? We all go through times in Life with challenges and despair. However, this new book offers a fast read packed with easily usable tips and tools to overcome discouragement and build solid foundations on which to grow personal and professional success. 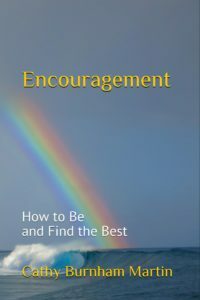 “Encouragement: How to Be and Find the Best” better prepares us to weather Life’s woes with greater grace and courage. Now we can allre-discover the natural confidence, self-esteem, and poise with which we were all born. It’s available now in both paperback and Kindle eBook formats. The Audiobook is coming soon! Grate zest from the orange to make 1 tablespoon. Squeeze the juice into a measuring cup, adding water or cranberry juice, if needed, to make ½ cup. In med saucepan over high heat, stir oj, grated zest, sugar, anise & cinnamon stick, until sugar is dissolved, 1-2 min. Stir in honey & pears; bring to boil. Then reduce heat to med and stir occasionally till edges of pears are barely tender, just 1-2 min. Stir in cranberries. Cook, stirring occasionally, till cranberries start to pop & pears are tender, 5-6 min. Let cool. Pour into serving bowl. Serve cool or cold. Makes up to 4 cups. KISS Tip: Make this up to 3 in advance. Cover and store in refrigerator. I love cranberries at any season of the year, so much so that I wrote an entire cookbook dedicated to this historic little fruit. 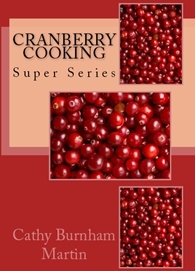 Check out “Cranberry Cooking” by Cathy Burnham Martin for more than 130 Keep It Super Simple recipes using cranberries… from beverages, sauces, side dishes and snacks to desserts, entrees, appetizers, and soups! Try the following appetizer that is both marvelously easy and jaw-droppingly delicious! The cranberry-crab combination surprised me and became a go-to favorite. 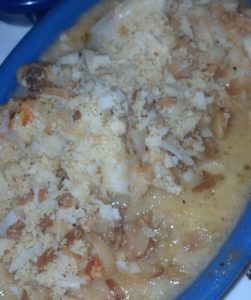 Combine cheese, crab and onions; push into one corner of a large plastic food storage bag. Snip off the tip of the bag’s corner to create a pastry bag. Squeeze the bag to push some crab combo into each tart shell. Spoon some cranberry on top. Bake 10 min at 350°F and serve hot. KISS Tips: You can make the crab cheese combo ahead and store in the refrigerator until needed. You can even fill the tarts up to 2 hours ahead of time without losing their crispiness. Keep this Super Simple by purchasing pre-made phyllo tarts. I find them in boxes of 15 in the frozen dessert section of the supermarket. To add some zestiness to the flavor, add a couple tablespoons of prepared horseradish to the crab-cheese mixture. As we approach an Election Day, could we all try to remember our sanity and decency? If our preferred candidates win, try to accept victory with humility and grace. If our preferred candidates lose, try to accept defeat with courage and compassion. We can expect and accept victors’ cheers and losers’ jeers. That’s all fine. I do not accept the ranting and rioting of losers, especially under the guise of peaceful protest. That is just plain embarrassing. We must do better. If you are an American citizen, cast your vote at the ballot box. Encourage others to do the same. If mainstream politicians win, so be it. If political outsiders and newcomers prevail, so be it. Black, white, male, female, conservative, liberal, whatever! Vote for good people. Vote for those you believe will make our country strong. Perfect. I hope that those who cast their votes differently also believe they are voting for good people, not just party politics. Regardless of election outcomes, I hope we all will try to spare others the sarcasm and cynicism and arrogance of feigned superiority. None of us is so special that we have all the right answers. If our preferred candidates win, may we gloat not with self-satisfaction. If our candidates lose, may we cling not to denial and anger. 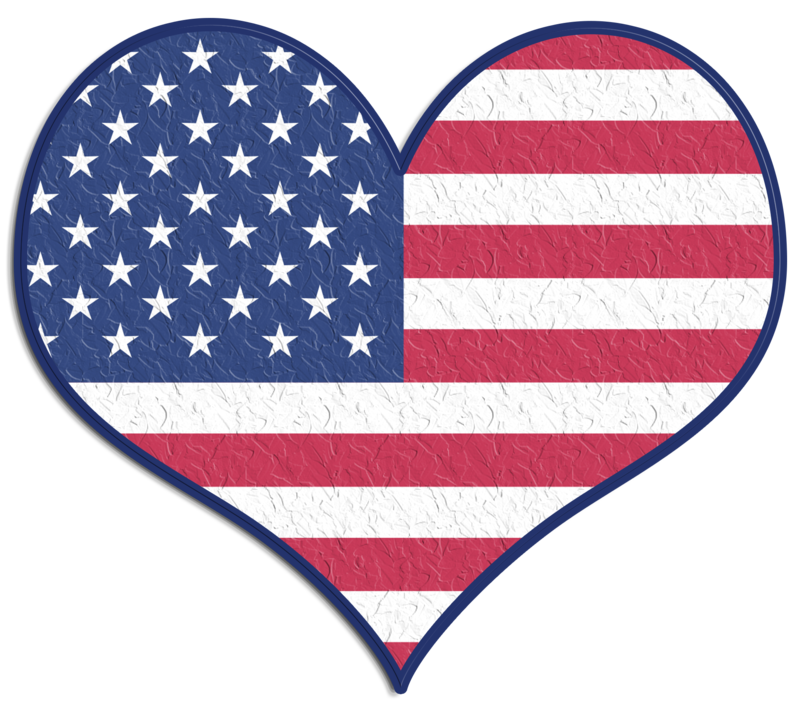 May we remember, we all want a strong nation, a booming economy, a safe place to live. We may not all recognize multiple “right” ways to achieve similar goals. Whenever we lose, we must remember that we are not alone. Millions of others lost also. We all must go through a process of grief and great sadness. Whenever we win, we must remember that we will not always win. We can breathe a momentary sigh of relief, and count our blessings, but we should appreciate that many of our dear friends and family members may be sad, heartbroken, and not celebrating. In each election comes grief and glory. Sometimes we’re the bug, and sometimes we’re the windshield. Disrespecting people we believe are disrespectful is counterproductive, at best. I am pleased to announce that I was selected to have my books featured at the upcoming Author Book Fair at the Collier County South Regional Library on 8065 Lely Cultural Parkway in Naples, Florida. I’ll be with some 3 dozen authors, so there will surely be some great books and fellow authors! If you are in Southwest Florida at the time, we’d love to see you! Sometimes Life is gleeful. Other times? Not so much. However, I believe there is nothing wrong with feeling, even through the difficult times. Someone lovingly pointed out to me recently that our blessings can even overwhelm grief. That is not to say that sadness can be obliterated, but it surely can be overshadowed. Life is rather like a rollercoaster, filled with highs and lows, from times that move slowly to those that zoom and scream along, seemingly out of control. And it is a very short ride, although most of us have a tendency at times to live as if we have countless years. Whatever “it” is for us, we fare better when we stop putting it off as if we have all the time in the world. We don’t. 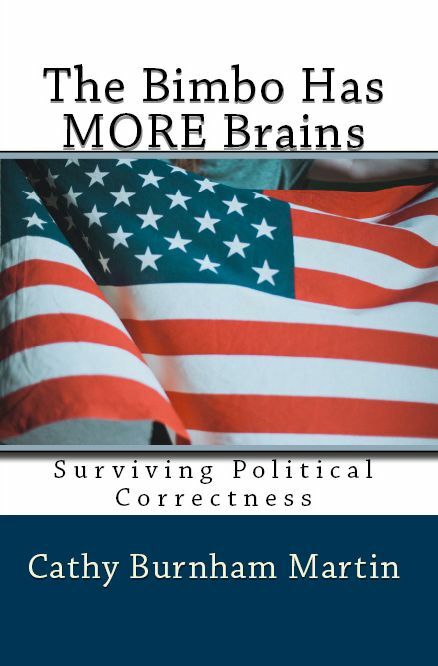 As I espouse in “The Bimbo Has MORE Brains… Surviving Political Correctness,” we can enjoy the feeling of living far more when we learn to live without regret. Too often things are said or left unsaid. We may have expressed harsh bitterness or relentless intolerance. We may have treated someone harshly. We may have been unfair. Our quiet regrets pile up in some corner of our mind. We never come clean. We never sincerely apologize. My Dad always set a great example in this area. Poppy always shared and said it all. Thus, when he passed, no one needed to feel the ache of words left unsaid. Harsh words were never the last ones spoken. Loving words were never left unsaid. Forgiveness seemed an almost automatic outpouring of love. This is so important, because all too often, we don’t get another chance. The person or people we may have hurt are gone. We do not have as much time as we may have thought. That said, I do not believe the souls of the departed hold any ill will. Only we living beasts harbor regrets and ill will. I couldn’t help but wonder what I might wish to say to people left behind if I was suddenly gone tomorrow. I’d thought about that a lot… Perhaps because we’d suffered some difficult personal losses. For that same second “Bimbo” book I wrote and shared my thoughts and words. Literally, I include my list of things that, as the departed soul, I would like to say to friends and loved ones left behind. Give it a try. I found it fascinating to see how easily we forgive those who’ve hurt us or caused pain and hardship for people we love. I loved feeling how happy it made me to recognize the hope and encouragement I relished giving to others. While Life brings us laughter and love, it also brings heartbreak and tears. Sad times make us better able to flourish and appreciate happy times. Feeling the whole spectrum makes us stronger and more compassionate people. Though I often say that living on this place called Earth is not for sissies, it is also an amazing ride. Let your heart flow. Relish and cherish. Believe and forgive. Learn and teach. Fall down and get back up. Through it all, feel yourself truly living. What kind of man spends his entire life serving others? Being kind and generous, true and loving? What kind of man is hardworking, resourceful, and an ahead-of-his-time thinker? Steadfast and persistent? With the patience of Job? What kind of man assigns himself the “on-call” work duties for every Thanksgiving and Christmas so his team can be with their families? What kind of man exudes tirelessness, delightful humor, and vivid imagination to fill his children’s lives with glee and exceptional experiences, while encouraging them to strive to be their very best? What kind of man is loyal to his high school sweetheart and best friend for more than 70 years? And near the end merely wishes for more time together? What kind of man walks the walk as a superbly encouraging and supportive father, uncle, and grandfather? Active in his church and community and neighborhood? Both a great listener and a terrific teacher, leading by example? It’s the kind of man we all dream about as a partner, father, friend or relative. He listens. He is humble and humorous. He is kind. He is strong. It’s the very special kind of man I have been privileged to call Poppy. My Dad, Robert Burnham, survived two previous cancers, only to be diagnosed this past winter with pancreatic cancer. His successful surgery this spring, inspired great hope, but infections have been challenging, and he has endured 2 returns to the hospital. This past week was the toughest. All seemed well as he enjoyed dinner in the dining room on Tuesday, but Wednesday, he was back to the hospital. Pneumonia had settled in his lungs. By Friday night at 9pm, they moved my Poppy into hospice. 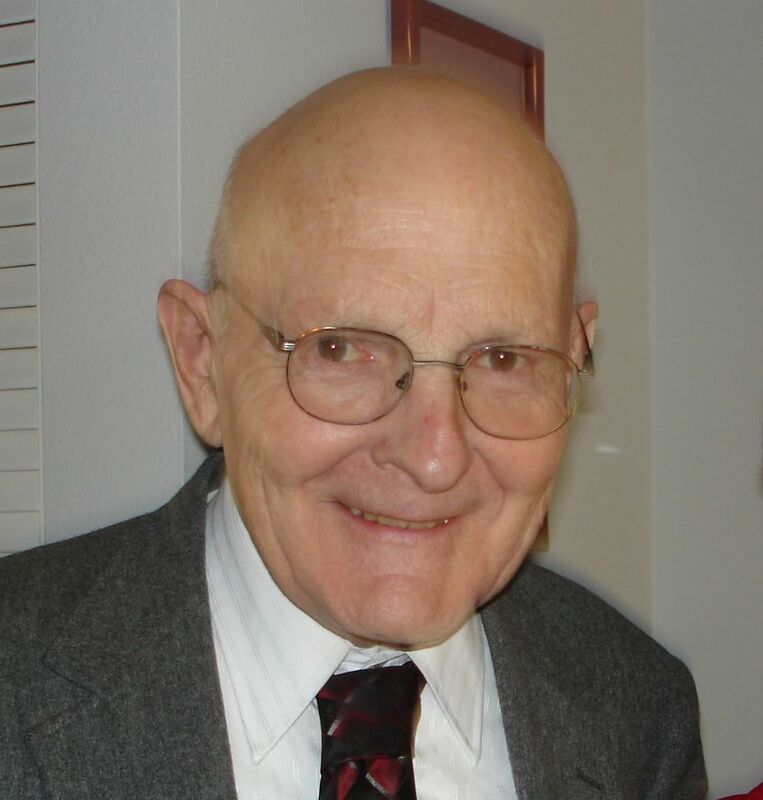 He passed peacefully in his sleep Saturday afternoon at 1:30. There’s one more angel in heaven. That’s the kind of man my dear Poppy was. An angel on earth. His spirit will always live with all of us who knew him. Prayers please for my Mom, for at age 88, though healthy physically, she has now lost the love of her life. God speed, my dearest Poppy. A lot of years passed as I developed the strength to both determine and stand up for what I could and would put up with in life. What is acceptable or unacceptable? The answers are different for each of us. Our tolerance levels also vary from person to person. Some things are simple. For example, I reached my threshold for people yelling at me. I decided I didn’t need to take it anymore. If someone is yelling at me now, it better be to save my life from an oncoming truck… not because they lack the personal control to talk at an acceptable volume level. Fair. When we think, feel, speak, or believe differently from someone else, I believe that is fine. However, we all know people who are not interested in tolerating different perspectives or ideas. That in and of itself doesn’t make either side more right or wrong. Where my interest disintegrates is when someone believes they can and should shout down others just to squelch a dissenting thought, voice, or opinion from being heard. I tune out the screamers and “ranters.” Their voracious volume levels and rabid rantings do not add validity to their opinions, no matter how frequently they repeat them. I get into this BIG time in “The Bimbo Has MORE Brains… Surviving Political Correctness.” I do not believe in suppressing dissenting voices. I believe in true dialogue, which includes speaking AND listening. I am grateful for having grown up with parents and educators who believed in us learning all sides of issues. They taught us how to think, not what to think. I feel most fortunate for that, among many other blessings. Saddening, if not maddening is the feeling when I learn of free speech getting squelched purely because someone else values a different philosophy or opinion. Phooey. As I state in the book, repressing or shutting down voices we may not care to hear dos not remove the thoughts, feelings, or opinions they wanted to share. I believe our differences give us balance. Intolerance of our differences throws us off balance. To tolerate someone else’s intolerance requires a great deal of patience, confidence, and persistence. We sometimes need to stop and remember that there just may be a lot of right in what seems wrong and a lot of wrong in what seems right. 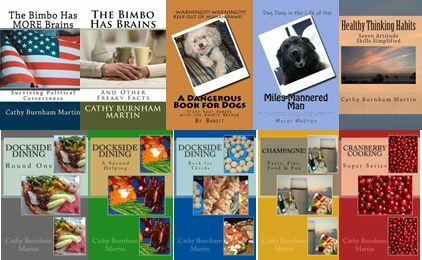 Cathy Burnham Martin is an award-winning journalist, published author, creative foodie, and communications geek. 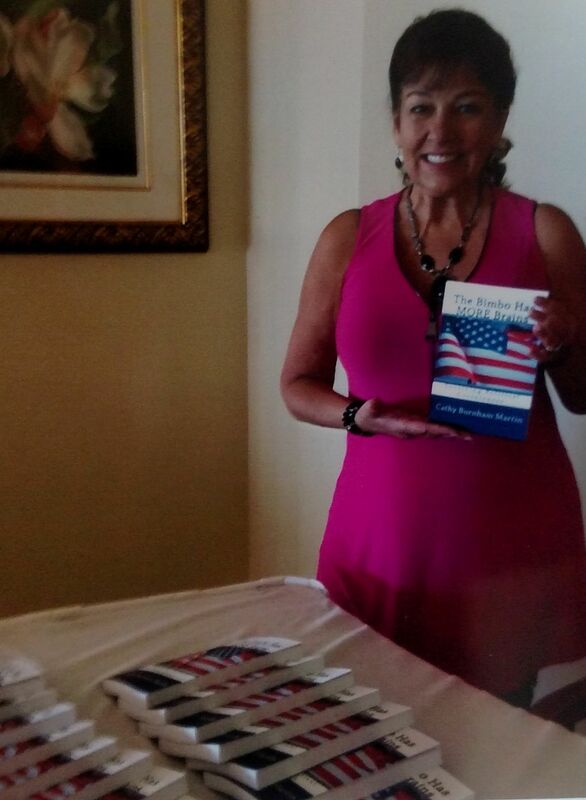 Her books and Audiobooks are available through all major book retailers, Amazon, and Audible. 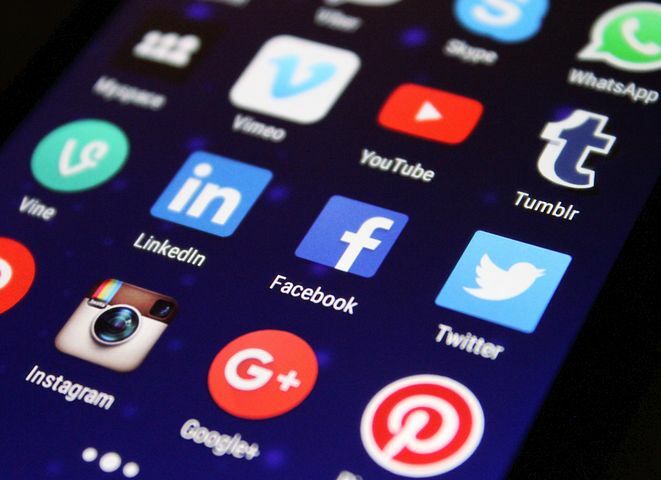 Like all of us, I know we should use social media safely. More importantly, I wish we would all use it responsibly and not as a weapon to hurt others. Yet, we all know people, with increasing frequency, who have expressed the need to unfriend or block someone who just can’t stop their negative rant. When nastiness and volume levels go up, up, up, sanity levels seem to go down, down, down. Social media seems more like anti-social media. I don’t care how different our opinions are. 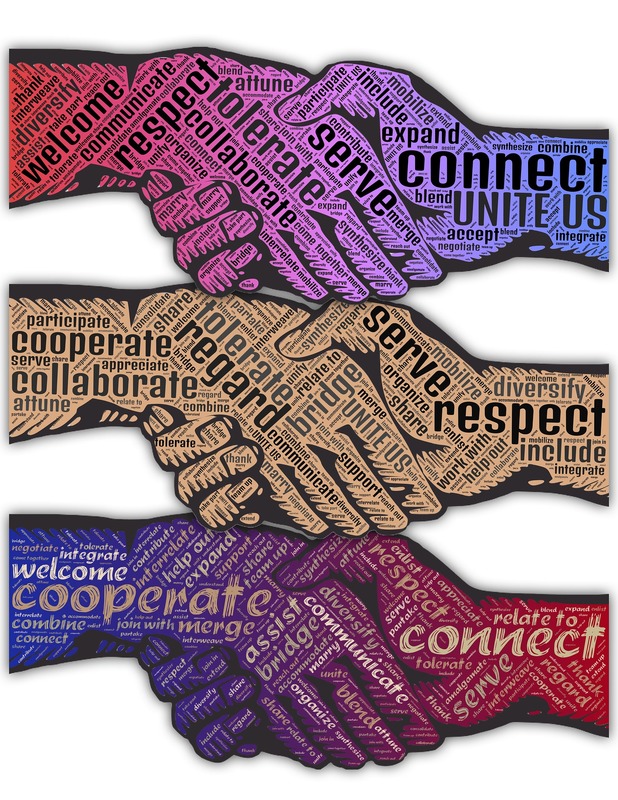 I care about how we treat each other, especially when we differ. We can and should do better. We must if we are to survive as a civilized group. In my book, “The Bimbo Has MORE Brains… Surviving Political Correctness,” I calmly note that there is no law against ignorance. The best we can do is to keep educating people. We need not waste one drop of anger on ignorance. That said, my heart aches when I read painful expressions from someone who has been railed against, especially on sites like Facebook. “Nastigrams” from naysayers and buffoons are bullying. Cyber-bullying is hideously ugly and cowardly. I like to remind my readers and friends that when someone else is being bitterly sour, we don’t have to drink from their cup. We must try not to let someone else’s lemons sour our hearts. Little supportive quips can help remind us, too. Devices and people work better when we turn them on, not off. Do not ever feel trivialized by someone else’s opinions. People who think that screaming louder makes their way of thinking more valid and profound should think again. They merely sound mean, belligerent, and intolerant… at best. 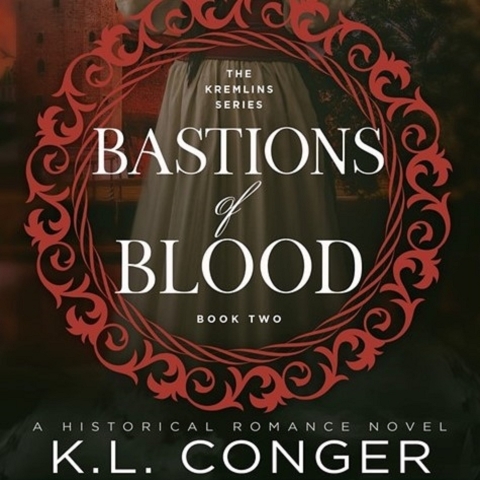 Just Released: “Bastions of Blood” — My Latest Audiobook! “Bastions of Blood” (Kremlins 2) is the sequel to “Citadels of Fire.” As the 2nd book in a 3-book series, I do suggest listening to “Citadels of Fire” (Kremlins 1) first. This is a powerful (and rather graphically violent) historical romance novel by a learned Russian history major. Want to thrive, not just survive, in this whacky world that demands political correctness? (Or what I call political quackiness!) My latest book slams the bullies and counter-bullies, examines political spectacles, reflects on the great American opioid epidemic of the 21st century, calls for Testosterone Toddlers to behave better, and much more. 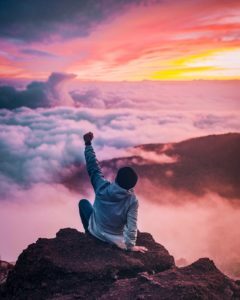 I’m advocating for respect, attitude checks, and personal responsibility on many levels, along with empowering the independent spirit in all of us. Recognizing friends and fiends on both sides of the political aisle, I am an equal opportunity offender… and mender. Thus, The Bimbo Has MORE Brains delivers the secrets for us all to lighten up, to be more tolerant and less easily offended. If you read it, please serve up a review online… via Amazon, Good Reads, Pinterest, or anywhere else. Good or bad, love it or hate it… ink is ink and talk is talk. I love it all. Thanks!! 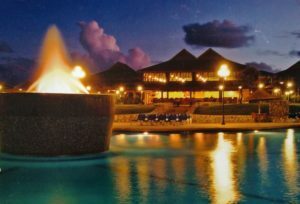 If you like island living… or vacationing… Antigua offers a beautiful and relaxing escape. 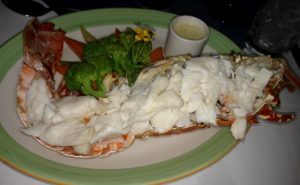 We just returned from a week of sun, fun, and superb dining, even a scrumptious grilled Caribbean lobster-stuffed lobster. This came as a big of a surprise. Consider this. 2017’s destructive hurricane season wreaked havoc throughout the Caribbean and U.S. mainland. We’d seen Southwest Florida looking far too much like a war zone after Irma left town. Islands in the Caribbean are still working to put basic life back together. 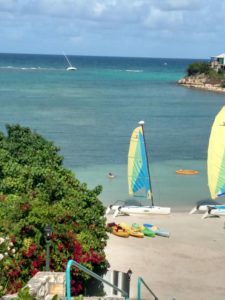 The Antiguan Paradise group of islands is bouncing back, but it will take much more time. For example, their island of Barbuda suffered 90% damage to its buildings and totally lost all infrastructure, like water and power. 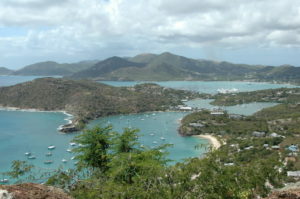 After the September storm, Antigua had to completely evacuate Barbuda’s population, bringing everyone to Antigua. These families are still nowhere near going home! Regardless, Antigua is firing on all cylinders. Famous ports like English Harbor and Falmouth Harbor, are full of action and mega-yachts. Festivals and regattas are all a full forward “Go!” Roads were horrid before the hurricane, so they’re more bizarre now, but don’t let it hold you back. Select a resort and go relax in the sun. We can enjoy a vacation in paradise. In the process, help so many hard-working people and their entire economy at the same time. Go for it and enjoy… with love and laughter. Add Lobaciousness to Your Life! My latest cookbook has just been released in paperback and digital formats. 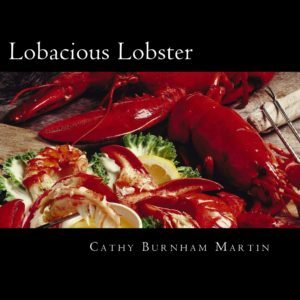 “Lobacious Lobster” is packed with 200 decadently delicious and super simple recipes, plus more than 100 color photographs. I literally could not help but create a new word to aptly describe lobster. “Lobacious” says it all! Enjoy this recipe from the collection! 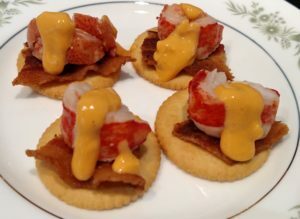 At serving time, place a piece of bacon on each cracker; top with a piece of lobster, followed by a drizzle of warmed con queso. Serve immediately. Makes 12 bites. Lobacious Lobster is available through Barnes & Noble, Amazon, and more. ‘Tis the season to add the tartness of cranberries to the menu. While I offer the Cranberry Cooking cookbook full of super simple recipes, I share here a yummy way to start a day with the zing of cranberries. We’re bringing it forward now for the holidays as a Cranberry Bellini. Be sure to start with well-chilled ingredients. Combine cranberry and peach; keep chilled till needed. Pour into tall flutes or martini glasses till just ¼ full. Top with prosecco; garnish as desired. Serve immediately. Makes 6-8 servings. with a wedge of lime, a slice of fresh peach, or “shrub”-style with a couple tiny scoops of raspberry (and peach) sorbet or sherbet. 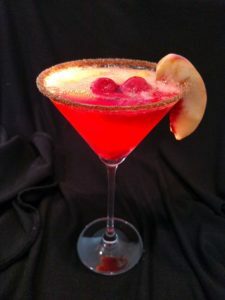 A nice variation for this drink is the Cranberry Pearrini. Make as above but replace the peach nectar with pear nectar. 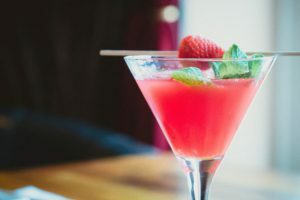 Garnish with fresh mint leaves and a large fresh raspberry. 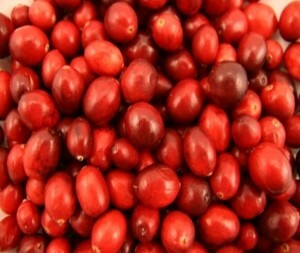 For other great cranberry recipes to take you from appetizers and tapas to entrées, side dishes, and desserts, check out Cranberry Cooking. It’s part of a series of 8 pocket cookbooks, all featuring easy recipes to help you star in the kitchen. They’re all available from Amazon, Barnes & Noble, and more. (If you buy one on Amazon, you can also get the digital edition FREE!) Have a wonderful Thanksgiving! 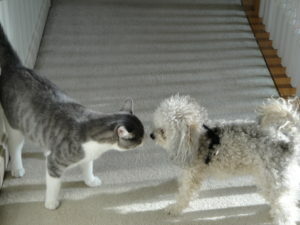 Well, Bandit, with all his 7 pounds of fun, fur, and fury, is very happy to have gotten that missive. He says he is planning a visit with his newest fan very soon… even though Mr. Casey ignored Bandit’s warning to NOT share his secret tips for training your humans with ANY humans. Sigh. Such is a dog’s life. Love, cookies, and belly rubs. 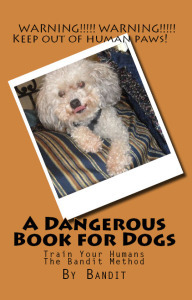 You can find Bandit’s “A Dangerous Book for Dogs” in paperback and digital (Kindle) formats on sites like Amazon and Barnes & Noble, as well as in Audiobook from Audible.com. I have received sooo many fabulous comments and positive reviews for my latest book, “The Bimbo Has Brains!” I am humbled and honored. However, I must thank YOU for supporting or contributing to my life’s journey to not only learn how to survive and thrive, but to then become able to share the many life lessons I gleaned with others. I had no idea that so many people would find this book as helpful in their / your personal journey through life’s stereotypes, double standards, and relationship mazes. This scores a 25% discount for $5 off when you purchase the paperback edition of “The Bimbo Has Brains” from the printer! (Sorry, but neither Amazon nor Barnes and Noble give me any discount options.) This UP3LM59T code does not expire and can be used multiple times and shared with as many people as you’d like. My latest book, “The Bimbo Has Brains,” made the Uncaged Book Reviews! Okay… it’s on the last page of the March, 2017 edition, but it IS a 5-star review, so I am pleased to have been chosen as one of reviewer Amy Shannon’s favorite reviews. Life is a very difficult place to live. The telephone rings. A loved one has passed. At 39, he is too young… and gone way too soon. 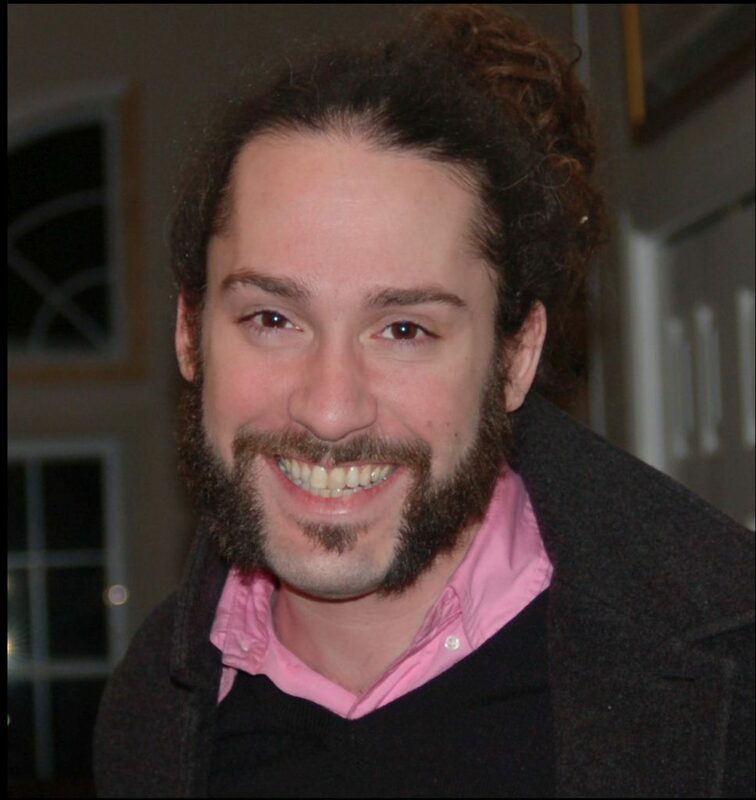 He is Christopher Martin, my husband’s first born and #1 eldest son. Please say an extra prayer for his Dad, his Mom, and his siblings. His passing turns the world surreal for everyone who knows and loves him. Christopher was brilliant. His creativity flowed like a 10-lane super-highway with the Flying Angels soaring overhead. His laughter and passion for living will dance in our hearts forever. His genuine interest in people and what makes us tick touched countless people who passed through his life. The trail of his footprints will be missed, as his path was cut short too suddenly. Hug everyone you love a little more closely. 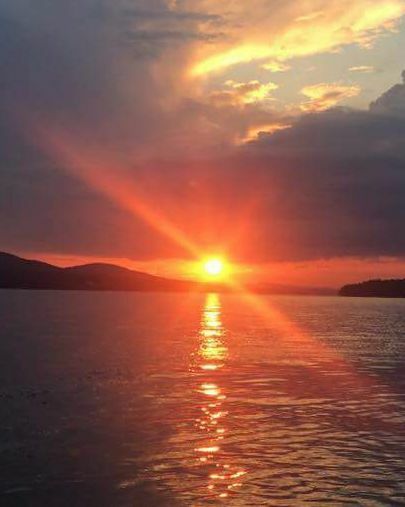 Take nothing for granted… not one single day. That’s straight from the printer and has NO expiration date! Enjoy!!! For Valentines Day and beyond, look for easy recipes. They can be assembled quickly with few ingredients. You can find yummy ideas in some unexpected places. For example, in the Dockside Dining… Back for Thirds cookbook, recipes were designed for backyard barbequing, tailgating, and simplicity for travelers, particularly on board on on the shore for boaters. But these recipes are easy to do indoors in a traditional kitchen, too! So many of them are perfect for pairing with your favorite wines or bubbly, too! For example, here’s a recipe from the Appetizers section. Melt butter in grill-safe skillet or heavy foil pan over med heat. Add onion & garlic; sauté 2-3 min till onions are tender. Add wine; stir for 1 min. Gently stir in crabmeat; remove from heat. Stir in mayo, seasonings, and parsley. Serve directly from the skillet or foil pan with buttery crackers, pita crisps, tortilla chips or melba toasts. 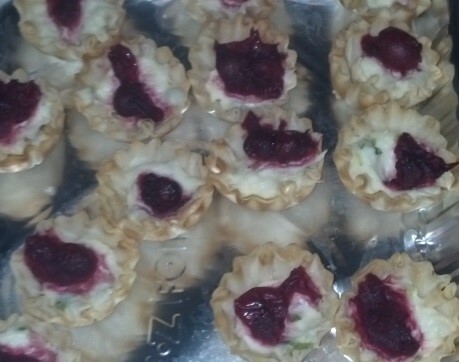 Or spoon into mini phyllo pastry cups. Makes about 2½ cups. KISS Tips: Try sprinkling a bit of shredded coconut, chopped or sliced almonds, or some panko bread crumbs on top. Or turn this into a brunch or lunch entrée by spooning over warm rice. Serve some of this to your sweetheart! Check Dockside Dining out. It’s available in both paperback and digital formats. More than 200 Super Simple recipes are packed into the sweet little 5×8″ size! There are salads like Orange You Glad You Like Melon and Far Out Far Eastern Chicken Salad. Brunch delights include French Toast Timboo Tavern, the Egg McMushroom Sandwich, and Berried Bacon Waffle Treasures. Other appetizers range from Crabby Bon Bons, Bacon-Stuffed Mushrooms, and Pears in a Blanket to Peachy Brie Bites and Roasted Pecan Crystals. There’s also an amazing Seafood Crisp a la Kretch’s Marco Island and a Sassy Super Hero Dip. Among the stellar entrees is the Sail Away Salmon, Riviera Rack of Lamb, and Cathy’s Lime Pepper Shrimp and Scallops. There are plenty of veggies and sides, soups, lunch ideas,and some saucy condiments. Of course, there are more than 30 sweet treats for dessert… or whenever. Some favorites are the Chocolate Covered Strawberry Dip, Super Simple Peach Cobbler, and a cake treat called For the Love of Eclair. Oh, yeah!!! So psyched. The Bimbo Has Brains just got our first review on Barnes & Noble.com and earned 5 stars! That is an exciting way to start. Also, Author Amy Shannon’s Bookshelf Reviews has now honored me as one of her featured authors and posted a lengthy interview about the book and me on her blog. Click to read. The Bimbo Has Brains has now officially launched! I feel so very blessed to have already heard from so many of you! I do so appreciate the well-wishes. Some have asked how long it took me to write this book. Most honestly, I must answer with “a combination of a few months and a few decades.” That’s what Life Lessons do for us. I truly do seek honest reviews on any sites from Amazon to Goodreads. If you will, please share the announcement of this new book with your circles of influence. Read on! Needless to say, we are quite excited! Details are on the QTPublishing.com website, along with info on the companion book by John A. Gehrisch, The Golf Pro Has Heart. 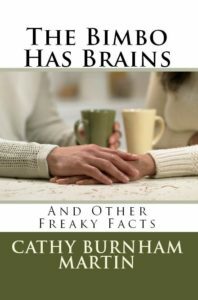 Today begins the official countdown to the release of my next book: “The Bimbo Has Brains… and Other Freaky Facts.” 31 Days to go! ‘Tis the season to make treats… AND protect our furry friends from them. In the book released by our dog, Bandit, this year, he includes a long list of items that we humans might not realize are poisonous for our dogs and cats. As I was preparing dinner last evening, I was reminded of this. While chopping some onions, a piece flew onto the floor. As is usual for Bandit, he quickly scurried toward the morsel. He knows this as “Clean Up, Aisle 4.” However, on this occasion, I had not called out, “Clean Up, Aisle 4.” In fact, knowing that onions are on the very serious Oh-No list, I had already made my move to quickly reach the onion chunk first. Bandit gave me quite the disappointed look. But, it’s all about keeping them safe. With more than 100,000 cases of pet poisoning just last year, we can’t be too careful. 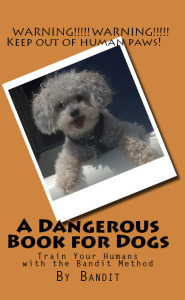 “A Dangerous Book for Dogs” is truly a riotous romp for dogs on how to train their humans. Naturally, Bandit felt he should include some free bonus goodies… because you’ve been good. One of them focuses on food and treat safety. As the list is several pages long, and goes into a great deal of detail, I will just give a few important highlights here. The list goes well beyond foods. For example, while I won’t list every specific detail here, in general, keep all human and pet medications, as well as chemical treatments away from your animals. Household cleaners and personal care items are also big no-no’s. The list of harmful plants should also be considered, including the likes of aloe, daisies, marijuana, and tobacco, for just a few. It’s the foods we consume that cause the most common angst. In a nutshell, keep alcohol and caffeine away from dogs and cats, along with chocolate, grapes, raisins, fruit pits, citrus peels, garlic, mushrooms, onions, tomatoes, yeast dough, nuts, and avocado. While there are some specifics and varietal details within categories, these form a pretty important starting point. Despite the popularity for humans right now, don’t even let them get at coconut water, as it’s too high in potassium for dogs. Also avoid sharing dairy treats, as they are difficult for them to digest. Sigh. ‘Tis the season to enjoy goodies, but we all need to remember that to be good to our beloved pets, we need to protect them. For more information on Bandit’s “A Dangerous Book for Dogs,” (despite his warning to keep it OUT of human hands), check out the list of books at the blog, GoodLiving123.com. It’s available in paperback, digital, and Audiobook formats. Sorry, but being a lifelong Red Sox fan has also made me aware of other team’s sufferings from various “curse” experiences. I only wish the World Series could have been Cubs v Red Sox. WARNING!!! Don’t let this book fall into human hands!!!! That’s Bandit’s strong advice regarding his new book. A Dangerous Book for Dogs is filled with insider tips and secret strategies to help canines get and keep their humans in line. Some wonderful advice was also shared by his various canine pals, too. You’ll find many chuckles along the way as you recognize how some of your own human friends try to understand and cope with their own paws-itively wonderful friends. 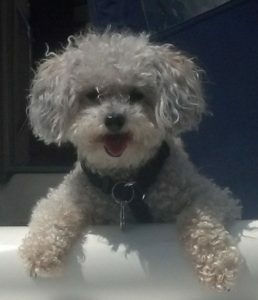 Bandit… sometimes known as 7 Pounds of Fun, Fur, and Fury… serves up some superb FREE Bonus treats as well. If you are a big fan, you can also get the full, unabridged text in a full-color edition by the same title. Only the cover photographs differ. The regular paperback (with Bandit lounging on a striped pillow on the cover) contains the same nearly 150 photographs inside as the full-color edition, although they are in black-and-white. For the full-color edition, look for Bandit propped up on a white pillow. Always the Pillow Puppy… helping him rest as he shares his wisdom. Now Bandit will start producing the full, unabridged edition as an Audiobook. That is scheduled for release this Spring! Where was THIS book when I NEEDED it? While it may sound wild, hormonal imbalance affects more people than diabetes, heart disease, and cancer combined! Yikes! 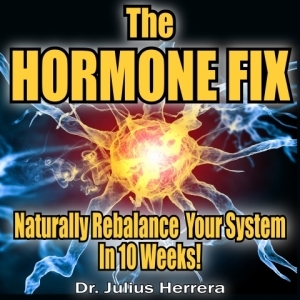 Written by Dr. Julius Herrera, “The Hormone Fix” explains the reality of the science within us AND delivers a natural approach to feeling healthy and balanced, regardless of the “time of the month” OR the time of your life. Check the new Audiobooks page on my blog www.GoodLiving123.com to see how I’m celebrating my new career twist in the New Year. After doing voiceover work for decades, I am a Johnny-Come-Lately to narrating Audiobooks, and I am loving it!!!! I will keep updating the list as I complete works… I am narrating my own books as well as those by other authors. They’re available on sites like Audible.com, Amazon, iTunes, and such. Anyway, one of the books may be most appealing this winter as so many of us try to include good health habits and weight loss among the New Year’s resolutions we hope not to break. 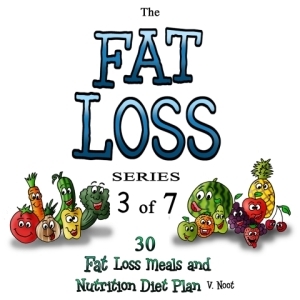 I recorded “Fat Loss Tips 3,” the 3rd book in The Fat Loss Series. Book 3 in the 7-volume series focuses on food. It packs a lot of eating tips, along with the real “skinny” on low carb, high fiber, trans fats, and more. Also in the 90-minute Audiobook, you’ll get fat loss meals and a nutrition plan, including weight loss breakfasts, lunches, dinners, and snacks. Check out the whole list of books I’ve finished narrating at this point. If you’d like to do an Audiobook review on any of the titles, email me at QTPub123@aol.com and I’ll try to get you a code for a comp copy. Meanwhile, enjoy 2016… with love and laughter. 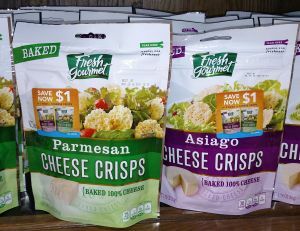 Cheese Crisps Have Hit the Stores! Since I first made these gems in the late 1970’s, folks have asked why I didn’t sell them. That’s not my focus, but I figured someone else would… someday. That day is now. “Fresh Gourmet” is the name under which they are manufactured. I’ve now seen them in supermarkets in both the North and South. They offer two varieties… Parmesan and Asiago. The contents match my simple one-ingredient approach. Cheese. Just cheese. 100% real, gluten-free, dairy-rich cheese. Nothing else. Nada. Bupkiss. While the supermarket variety is a small 1” size disk, I advocate making them in a variety of sizes, to suit your needs. Small ones to replace crackers. Large disks to top a salad. I also do some other “shape” treatments for visual interest when placing my Cheese Crisps out with cocktails and other tapas items. You can “crinkle” each disk a bit or roll them into tubes, but you must do this while they are still fresh and hot from the oven, since they cool very quickly to a nice crispy texture. Before I give you the recipe again, let me answer the questions I have already gotten from personal friends. No, I have no plans to buy them again. They are just too super simple to make. I could imagine myself buying a bag if I was traveling and wanted a cheesy snack for the road. If you want a zero carb snack with all the crunch of a cracker, these babies deliver! Plus, I make them in lots of flavor varieties, beyond Parmesan and Asiago. Favorites include Pepper Jack and Muenster, by the way. The original idea came from picking at cheese that had melted off my nachos and gotten crispy on the foil-covered baking pan. Oh, yeah! So, here’s the recipe for you. Space 4 pieces of cheese in a Pyrex pie dish or 8” square baking dish. Microwave on high 1 minute (or up to 90 seconds depending on your microwave. (It helps to start with a warm plate, or you may need to flip the first batch of cheese over and cook 15-30 sec more.) Cool on paper towels. Make as many as you like! Store in airtight containers at room temperature or they will lose their crispness. KISS Notes: A popular restaurant at a Sheraton hotel started serving my Parmesan version of these beauties atop their Caesar salads in 1976. While such crisps pop up frequently in restaurants now, they were quite the novelty in the 1970’s and even ‘80’s. 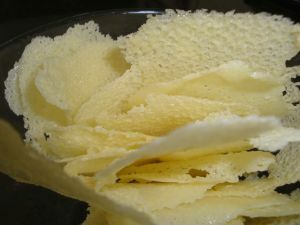 I refined them in 1980 to this microwaved technique & with more varieties to serve as AWESOME carb-free crackers for friends trying the Atkins Diet long before carb-free items appeared in stores. I also served them as a super snack with wine… I still do. This recipe appears in a couple of my cookbooks, including Volume 1 of “Fifty Years of Fabulous Family Favorites” along with the recipe for my original baked version. The cookbook “Dockside Dining – Round One” also gives some clever tips on turning these into Cheese Crisp Canapes. Enjoy on this New Year’s Day… with love and laughter. ‘Tis the season to start savoring the tartly delectable cranberry! My Cranberry Cooking cookbook (in paperback and digital formats) celebrates one of America’s most under-rated fruits. Whether you enjoy them in breads or desserts, sweetened in a sassy sauce, nestled into a perfect pork or poultry entree, or sprinkled over a sweet potato casserole, “yum” comes to mind with all these recipes, more than 100 in categories from breakfast to dessert, and this is the time of year when we can enjoy them with all their popping crisp freshness. Naturally I love giving a couple of the recipes free, because while we don’t mind paying for good cookbooks, FREE is always appreciated, I know. 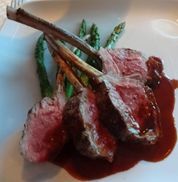 We just had some friends over for a rack of lamb dinner party, so lamb is on my mind right now. While most folks typically think of cranberries in sauces, desserts, breads, or beverages, their entrée applications are marvelous. In the olive oil in a heavy sauce pan, sauté onion 3-5 min over med heat, stirring frequently. Stir in cranberries, marmalade, brown sugar & orange juice; salt to suit your taste. Cook over med heat 5 min, stirring frequently, till sugar dissolves & cranberries pop. Remove from heat; set aside. Arrange lamb chops on cooking-spray coated grilling rack in foil-lined, shallow roasting pan. Broil 6” below heat source for 2-4 min per side, or until desired degree of doneness. Serve chops with chutney. Makes 2 servings of 3 ribs each. KISS Tip: Broil 2 min per side for med-rare, 3 min per side for medium, and 4 min per side for med-well. Now, I realize that lamb may or may not be a favorite of yours, so I also include a poultry entrée to tantalize your tastebuds. I created this recipe in 2007, inspired by a childhood favorite that used apricot preserves. Place stuffed breasts in bottom of slow cooker. Sprinkle liberally with paprika & soup mix. Spread cranberry sauce over them; pour on the vinaigrette. Cover the cooker; cook on low for 4-5 hrs. Pour liquor over top & stir a bit. Cook 5 more min & serve with long grain & wild rice and a green vegetable. The Keep It Super Simple kitchens delighted in compiling this collection of scrumptious cranberry recipes… from appetizers and sauces to salads and entrees… for the KISS™ cookbook Super Series from Quiet Thunder Publishing. 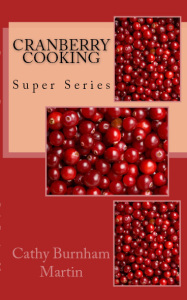 Cranberry Cooking, plus all the other books in the Super Series are conveniently bound in a handy 5×8” format. If you prefer digital editions, you will also find them on Kindle. Cranberry Cooking is a special book of Super Simple recipes to help make Good Living as easy as 1-2-3. Enjoy… with love and laughter! It’s a first for the Manchester Community Music School… tonight’s swinging 1940’s style USO-type show, packed with music and guest stars…. All performing on a volunteer basis to support the great work being done at the school. Fifty of New Hampshire’s most celebrated and professional musicians serve as faculty for more than 1200 students from throughout the region and our neighboring states. Tonight we celebrate! Enjoy air-conditioned comfort, free refreshments & free raffle tickets… along with great entertainment! My hubby (The Ronald aka Ron Martin) is one of the hosts, alongside Mike Reed… playing his rendition of Bob Hope… or Bob “Hoop” as I call him… with a little “Bling” Crosby and friends. You’ll catch the famed 48+ piece Summer Band, the Capital Jazz Orchestra Trio, the sensational NH Youth Jazz Combo, plus a couple star numbers from Dance Visions Network. And vocalists? Boston recording artist Bill Andrews, former Miss New Hampshire Michelle Lamontagne, musical theatre buff Paul Padfield, superb Manchester Community Music School voice student Megan Jurnak, and the buttery baritone stylings of Lloyd Owens. Doors open at 6pm for the 7pm show at the school on 2291 Elm Street in Manchester’s north end. General admission tickets will be sold at the door. When the 3-volume set “Fifty Years of Fabulous Family Favorites” came out in April, it included the 1,000th recipe that I have published! (It’s been a very busy two years!) I actually first developed this dish in 1979; I just hadn’t started writing the books yet. This gem has stood the test of time beautifully. Appropriately, for my taste buds, my 1000th recipe features lobster! So, in my traditional GoodLiving123.com blog fashion, I must give you that dish as a yummy freebie. Melt butter over med-low heat in large skillet or Dutch oven; sauté green onions 1 min. Add shrimp; sauté 1 min, till turning pink. Remove shrimp & onions with slotted spoon; set aside. Add garlic & spinach to pan; stir 1 min, just to start turning spinach limp. Stir shrimp mixture back into pan; stir in Alfredo sauce & cream (or wine) till mixture is your desired consistency. Season with pepper. Serve as is or over hot pasta of your choice. Makes 4-6 servings. Now… to the lobster. THIS makes the best variation… substitute large fresh lobster meat chunks for the shrimp. Ooooh la la!!! Yum, yum, yum! Enjoy… with love and laughter! They swamped me with work over these past three months, but my newest series has now arrived! 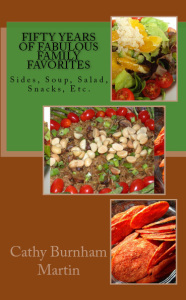 You’ll find over 600 recipes from my family, extended family, and some dear family friends. Recipes were collected and preserved, some for generations. 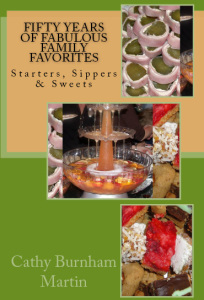 Volume 1 contains Starters, Sippers & Sweets. 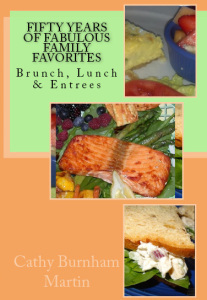 Volume 2 features recipes for Brunch, Lunch & Entrees. Volume 3 folds in all the rest with treasured recipes for Sides, Soup, Salad, Snacks, Etc. In the KISSTM tradition, the collection emphasizes recipes that are Super Simple, though a handful, admittedly, have longer ingredient lists than usual. Each volume in the series is presented in 5×8” paperback style in the Super Simple tradition. They’re all available directly through my GoodLiving123.com blog and also online. However, as with all my works, if you purchase through Amazon, the full-color digital edition is free. Now you’re cooking with Cathy… and family. Enjoy… with love and laughter! Thanks to all for so much support! You’re the best!!! My latest book is hot off the presses: “Champagne! 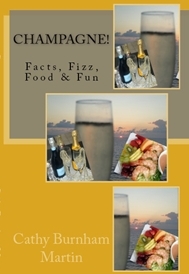 Facts, Fizz, Food & Fun.” All profits from December sales go to support scholarships and musical instruments at the Manchester Community Music School, for which I am a volunteer and member of the Board of Directors. We have more than 1200 students now, and the programs, such as music therapy, are gleefully growing like crazy. Check out the book at the Quiet Thunder Publishing site www.QTPublishing.com or on sites like Amazon or Barnes & Noble. Of course, details are also in the Books section on the GoodLiving123.com blog. Beyond insider tips on serving bubbly and setting up theme parties, you can enjoy more than 130 recipes for sparkling beverages and food dishes to serve with champagne.